The melody that would be borrowed for the Star Spangled Banner was extremely popular and well known at the time the future U.S. national anthem was penned. It is known to have been used for at least 84 popular songs in the United States alone, including Adams and Liberty – The Boston Patriotic Song and the subsequent tune Jefferson and Liberty, written after Jefferson was elected President. The original song that used the melody was To Anacreon in Heaven, written sometime between 1760 and the late 1770s, expounding on the virtues of wine. The song itself was first publicly published in The Vocal Magazine in 1778 in London. The music was composed by John Stafford Smith and the lyrics are thought to have been written by Ralph Tomlinson, president of the Anacreon Society, which was a popular gentleman’s club in London whose membership were dedicated to “wit, harmony, and the god of wine”. The society chose the famed Greek poet Anacreon as their “patron saint” as he was particularly known for composing odes to merrymaking, women, and wine- among the Anacreon Society’s favorite things. When Old Thunder pretended to give himself airs. The Devil, a Goddess, will stay above stairs. Away to the Sons of Anacreon we’ll fly. The Myrtle of Venus with Bacchus’s Vine. And the bi-forked hill a mere desert will be. Cry’d “Sic evitable fulmen” you know! Preserve Unanimity, Friendship, and Love! You’ve the sanction of Gods, and the Fiat of Jove. “May our Club flourish Happy, United, and Free! The tune to this little ditty became wildly popular and was adapted to a variety of other lyrics, as was the practice at the time. The lyrics that ultimately became the most historic to use the tune were those written by attorney Francis Scott Key while he sat on a British ship at a distance from the Battle of Fort McHenry that took place on September 13-14, 1814 during the War of 1812. Key was a temporary prisoner aboard a British ship, along with his companion Colonel John Stuart Skinner, as they’d been sent there to try to secure the release of a few Americans, including an American doctor being held by the British, Dr. William Beanes. During dinner with Vice Admiral Alexander Cochrane, Rear Admiral Sir George Cockburn, and Major General Robert Ross, Key and Skinner plead the case for the release of the prisoners, which they eventually got the British to do in the case of the elderly Dr. Beanes. However, Key and Skinner were held for the duration of the battle as they’d had occasion to observe the strength and apparent strategy of the British forces. So they were not to be released until after the battle was over, held on a ship about four miles from the battle front for their safety. Key wrote some of the lyrics during his stay on the British prisoner ship, after seeing the “flag was still there”. The rest he finished up at the Indian Queen Hotel when he was released in Baltimore two days after the battle. The lyrics were first published in the Baltimore Patriot and The American newspapers on September 20, 1814 under the title Defence of Fort McHenry. It was quickly picked up by fifteen other newspapers in the United States and its popularity grew from there. It wouldn’t be published under the name “Star Spangled Banner” until Thomas Carr started selling the lyrics and sheet music together at his music shop in Baltimore under that title. As for when it became the United States’ official national anthem, that occurred on March 3, 1931 when President Herbert Hoover signed a Congressional resolution into law to this effect. Before this happened, Hail, Columbia (“Columbia” being an alternate name for America particularly common in the 18th century) and My Country, ‘Tis of Thee were often more popularly used in that role. The Star Spangled Banner wasn’t the first time Key had used the To Anacreon in Heaven melody for a poem of his. He also used it in When the Warrior Returns written in 1805, which the Star Spangled Banner lyrics borrowed heavily from. Putting new lyrics to an already existing melody or piece of music is known as a contrafactum. Another popular contrafactum that has survived to today is the ever popular Alphabet Song, which borrowed its melody from Twinkle, Twinkle, Little Star. Among other things, the Anacreon Society was well known for putting on concerts where the members would perform. These were well attended events; Joseph Haydn himself is known to have attended one of their performances in 1791. Key’s son, Philip Barton Key II, was murdered by U.S. Congressman Daniel Sickles, who got off Scot Free. Sickles had discovered that Philip Key was having an affair with Sickles’ wife. My Country, ‘Tis of Thee’s melody is from God Save the Queen/King. The lyrics for My Country, ‘Tis of Thee were by Samuel Francis Smith who wrote them in about half an hour when a friend at Andover Theological Seminary asked him to translate some German songs’ lyrics to English. One such composition, Muzio Clementi’s Symphony No. 3, included the theme to God Save the Queen/King. When looking over it, Smith was inspired to write his own lyrics to the melody. My Country, ‘Tis of Thee was first performed by children on July 4, 1831 at an Independence Day celebration in Boston. The music for Hail, Columbia was composed in 1789 by Philip Phile for the inauguration of George Washington. Lyrics were later added in 1798 by Joseph Hopkinson. Today Hail, Columbia is commonly used as the walk-up music for the Vice-President of the United States. Hail to the Chief is used for the President. The first known instance of the Star Spangled Banner being played at a Major League Baseball game is somewhat up for debate. It is conjectured by some that it was during the opening day ceremonies in a game in Philadelphia in 1897 and then again in 1898 at the Polo Grounds. Whether this is true or not, the first unequivocally true instance of the Star Spangled Banner being played at a Major League Baseball game was during the 1918 World Series between the Boston Red Sox and the Chicago Cubs during the 7th inning stretch. This song was played due to the United States’ involvement in WWI and the “Work or Fight” edict that had shortened the baseball season, resulting in the World Series being played in September. Despite this early performance, it wouldn’t become common for the Star Spangled Banner to be played at Major League Baseball games until the U.S. became involved in WWII. Boston won the 1918 World Series 4 games to 2, despite only scoring 9 runs the whole series. That is still a record for the fewest runs scored by a team that won the World Series. It would be 86 years until the Red Sox would win another. The Cubs are still amidst their World Series drought, with their last such championship being in 1908. The two teams wouldn’t play again until June 10, 2005 during an interleague series in Chicago. Believe it or not, a major push for the United States to adopt an official national anthem was partially spurred by Ripley’s Believe It or Not! On November 3, 1929 Ripley included in a cartoon the text, “Believe It or Not, America has no national anthem.” Momentum for an official anthem grew and, as stated above, on March 3, 1931 President Herbert Hoover officially signed a Congressional resolution into law making the Star Spangled Banner the United States’ national anthem. The Star Spangled Banner had previously been promoted by President Woodrow Wilson when in 1916 he ordered it should be played at various military ceremonies. 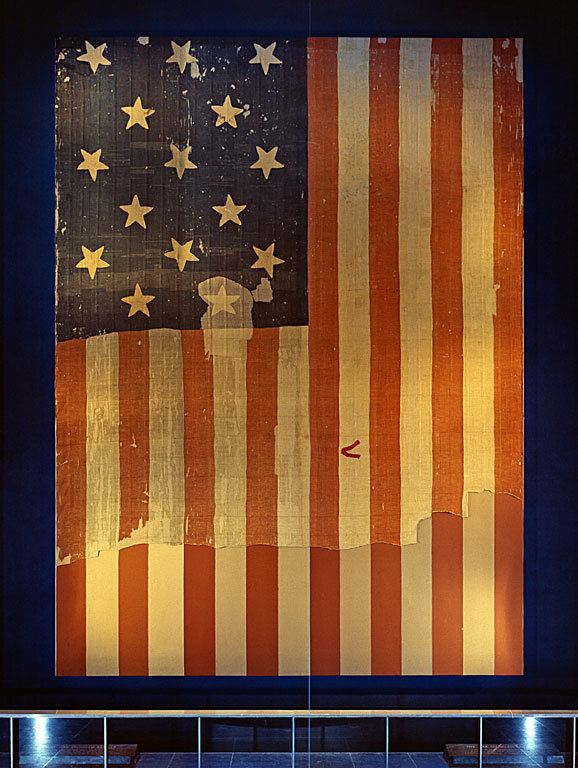 The actual flag flown over Fort McHenry on the morning of September 14, 1814 is on display in the National Museum of American History. It has 15 stars and 15 stripes. Between their loved home and the war’s desolation.